It is one of the first pubs in Skopje with a large selection of beers and appetizers, and with a genuine pub atmosphere and charm. St. Patrick Irish Pub opened in 2000. 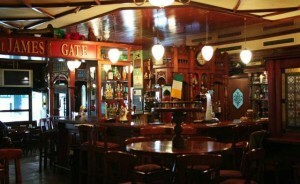 It is located on the river quay along with a dozen cafés and restaurants. 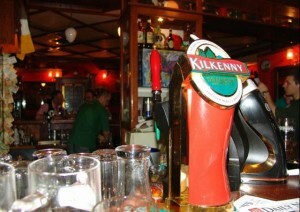 It is a favorite place for all beer fans in the city and for football fans from around the world. When important football matches are played the Irish pub looks like a stadium. People come dressed in their favorite team’s T-shirts, sing songs and cheer for their team. When the football season is over the pub is a nice place to chat with friends over cold beer and hot appetizers of course. The food is decent, and we suggest you try the chicken fingers and onion rings that are the most-ordered menu items.